Originally published on Elearning Industry. Making learning more game-like has been praised for making learning more fun and engaging, but occasionally criticized for being infantilizing or for not using game mechanics effectively. Gamification can be a great tool when used properly, but you have to implement a solid strategy to make it work. Combining too many game mechanics or combining them improperly can make your great idea ineffective. In this article, we’ll go over a “leveling-up” type of gamification strategy using many common LMS features. This can be a really useful approach for L&D professionals, whether they are new to gamification or have already used it in their training program(s). The leveling-up approach to gamification turns game mechanics into a tool that is equal parts motivational and practical. The levels function as a “gamified” version of learning chapters, which provide that extra fun factor while organizing content progression [CZ1] in a useful manner. Here are the different aspects that play a role in this strategy. In games, levels are often defined by missions or storylines. Once you complete one, you get access to the next, more difficult storyline. Curiosity and desire to achieve/conquer make levels motivating. In an LMS, the learners progress through different learning levels as they complete content and courses. The levels can be indicated by changes in page theme, colors, or more. The next level can indicate a promotion or amount of authority within the company. The important part is, there is a transformation that indicates an achievement to the user. The user can revel in this and feel rewarded that they achieved a new milestone. Providing a concrete structure helps certain learners thrive. Employees like to know where they stand and need information on what kind of learning they need to complete in order to move up. Employees looking to advance are often unaware of what skills are needed to take the next steps in their careers, and levels can become a guidebook for their careers; a kind of implicit mentoring. Badges are decorative, often colorful items that represent a particular achievement or skill obtained. In games, people often display them on their profiles and use them as bragging rights. It’s similar to levels in that they are earned upon content completion, however, they are more collectible. The user can view how many things they have achieved in a very visual manner, similar to the satisfaction of seeing how many items on a to-do list you have checked off. Badges also have a social component; they can be easily shared and compared, bringing social motivation to learning. In organizations, they also have the added benefit of being able to see who has training in which skills. It can be a way to quickly identify who to reach out to for questions or for inclusion on a project. Mozilla OpenBadges is a popular badging platform to design badges for eLearning. Homepage content is the first thing that a user sees when they log in. It can really set the stage for how they interact with the learning, as well as how they feel about logging in to learn. For this leveling-up approach to gamification, the homepage content changes to match the skill level of the learner. The page can offer reminders and links relevant to their status at the company and own knowledge. It can also direct them to content that will help users achieve the next level of learning. This turns leveling-up into not only a motivational tool but a strategically guided tour through career paths. The training content accessible in the LMS at each level can also be adjusted. As the learners advance, more advanced content may become available to them, ensuring that prerequisites are met and learners don’t become overwhelmed by courses upon the first login. For example, level 1 learners could complete onboarding courses, level 2 learners may see basic safety and HR compliance, and employees at level 7 can start seeing leadership and management courses to put them on the right path towards team lead. This leveling-up approach could be the engaging gamification methodology you’ve been searching for. It uses some of the simplest game mechanics that learning professionals tend to use for gamification while being relatively easy to implement. Good luck! 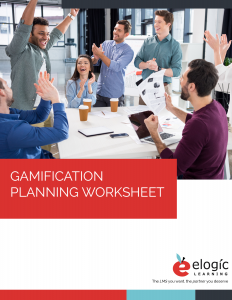 Download our free Gamification Planning Worksheet with helpful fill-in-the-blank areas and check boxes to make sure you have the tools, goals, and measurements in place to successfully implement a gamified learning project.